You are here: Renico Construction Latest News Property Market How much it costs to build in South Africa. How much it costs to build in South Africa. Looking to invest in a fixer-upper or a new build? Find out the construction costs per square metre in each of South Africa's provinces. The North West has the cheapest construction costs in South Africa currently, while KwaZulu Natal is the most expensive, according to a release by Stats SA. Stats SA recorded building plans passed by larger municipalities at current prices per province for the period Jan-July 2018. 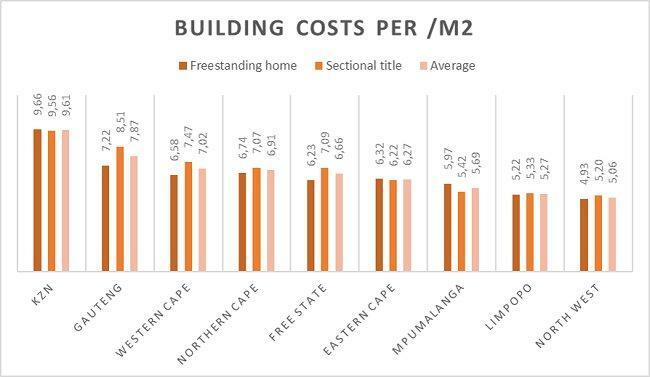 According to this data, The average building costs in the North West amount to R5 060 per m2 – R4 550 less than what it costs per square meter in the costliest province for construction, namely KwaZulu-Natal at R9 610 per m2. The second most affordable province is Limpopo, coming in at R5 270 per m2 followed by Mpumalanga at R5 690 per m2. Sitting at the opposite end of the price scale and at the second most expensive construction province is Gauteng at R7 870 per m2 followed by the Western Cape at R7 020 per m2. “While it is unsurprising to discover which provinces are the most affordable, it is interesting to discover that KwaZulu-Natal is more expensive than the bustling metropoles of Gauteng and the Western Cape where one has come to expect to pay a premium on most living expenses,” says Adrian Goslett, Regional Director and CEO of RE/MAX of Southern Africa. Grant Gavin, Broker/Owner of RE/MAX Panache operating in Durban North and La Lucia advises local homeowners who are considering moving to a home with additional rooms or space to look for opportunities to build onto an existing structure rather than to build a new home from scratch. To understand the difference in prices per province, you should know that there are several factors that affect construction costs. The first of which is the cost of the actual building materials; items such as bricks, cement, timbre and so on. If a province is low on suppliers for these materials which lowers the chances for competitive prices, or if a province has to import them, then it’s likely that that province will have higher building costs. While KwaZulu-Natal proved to have the most expensive costs despite paying their construction professionals 11% below the national average, the two other major metropoles still managed to rack up more square meters of approved plans. The province which approved the largest amount of building plans per total square meterage for this period was the Western Cape with a total of 1,413,402 m2 in approved plans. Gauteng followed at 1,111,604 m2 in approved plans, and KwaZulu-Natal placed a distant third at just 291,014 m2. “Interestingly, Gauteng outperformed the Western Cape in terms of plans for freestanding properties, while the Western Cape outperformed Gauteng in terms of plans approved for townhouses and flats. This makes sense, as more and more Capetonians are choosing renovate their sectional titles closer to the CBD rather than relocate to freestanding homes where they would be forced to endure the commute,” Goslett concludes.